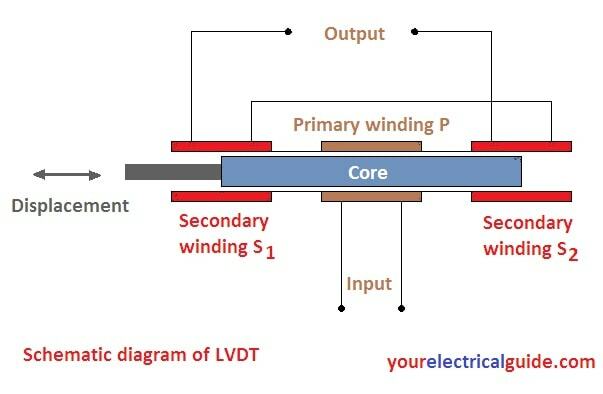 Hi friends, in this article, I am going to discuss about lvdt theory, lvdt advantages and disadvantages. My article will increase your knowledge, I hope so. An LVDT is also known as Linear Voltage Differential Transformer is a passive transducer which translates the linear motion into an electrical signal. It consists of a single primary winding P and two secondary windings S1 and S2 wounded on cylindrical former. A movable soft iron core is placed inside the former. The displacement to be measured is applied to an arm connected to the core. The assembly is placed in a stainless steel housing and the end lids provide electrostatic and electromagnetic shielding. Both the secondary windings have the equal number of turns and are wound on both sides of the primary winding exactly alike. These windings are connected in series opposition so that EMF induced in each coil opposes each other. The primary winding is connected to an AC voltage source. The frequency of AC applied to the primary winding may be in the range of 50 Hz to 20 KHz. 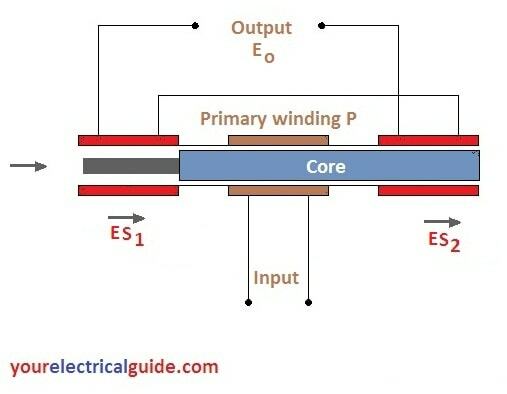 Since the primary winding is connected to an AC source it produces an alternating magnetic field which induces AC voltages in two secondary windings. The output voltage of secondary S1 is ES1 and that of secondary S2 is ES2. 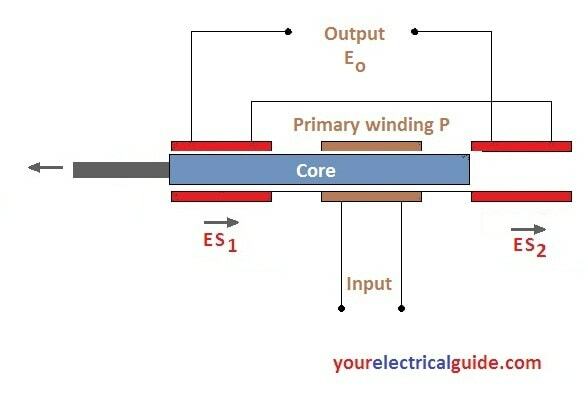 Since, both the windings are connected in the series opposition the output voltage of the winding (Eo) will be the difference of the two voltages i.e. When the core is in the center or NULL position the induced EMF (ES1 and ES2) in both secondaries are equal and out of phase, the output voltage will be zero i.e. When the core moves to the leftward position, flux linking with S1 will be more than S2. The induced voltage ES1 will be more than ES2. The output voltage will be (ES1 – ES2) and the output voltage will be in phase with ES1. If the core moves rightward position from the NULL position, flux linking with S2 will be more than S1. The induced voltage ES2 will be more than ES1. The output voltage will be (ES2 – ES1) and the output voltage will be in phase with ES2. Thus, the output voltages are proportional to the core displacement. As the core moves in one direction away from the NULL position, voltage in one secondary increases while in the other secondary decreases i.e. the output voltage (Eo) which is the difference of the two voltages increases. The output voltage may be amplified by an amplifier. The amplified output can be measured by an electronic voltmeter which can be calibrated in terms of displacement. The output voltage of an LVDT is a linear function of core displacement within a limited range of motion (up to about 5 mm from the null position). The curve starts to deviate from a straight line, after this range. Ideally, the output voltage at the null position should be equal to zero. However, in actual practice, there exists a small voltage known as Residual Voltage, at the null position. This may be by virtue of the presence of harmonics in the input supply voltage and also due to harmonics produced in the output voltage on account of the use of the iron core. There may be either some magnetic or electrical unbalance or both which result in a finite output voltage at null position. Other causes of residual voltage are stray magnetic fields and temperature effects. This residual voltage is generally less than 1% of the maximum output voltage in the linear range. However, with the use of batter AC sources and improved technological methods, the residual voltage can be reduced to almost a negligible value. High Range: LVDT can be used for measurement of displacements ranging from 1.25 mm to 250 mm. With a 0.25% full-scale linearity, it allows measurements down to 0.003 mm. Friction and Electrical Isolation: Generally, there is no actual contact between the movable core and coil structure that is, the LVDT is a frictionless device. The absence of friction means that there is no wear and tear. This provides an infinite mechanical life to an LVDT. In an LVDT, a complete isolation exists between input and output. This makes it very suitable for many applications. High Output and High Sensitivity: The LVDT gives high output and many times there is no need for amplification. It posses high sensitivity, typically about 40 V/mm. Ruggedness: Usually, they can bear a high degree of shock and vibrations without any adverse effect. Due to their small size and lightweight, they are stable and easy to align and maintain. Low Hysteresis: They show a low hysteresis and hence repeatability is extremely good in all conditions. Low Power Consumption: LVDTs consume low power, typically less than 1 W.
They are sensitive to stray magnetic fields, therefore, magnetic shielding is necessary. Sometimes, the performance of an LVDT is affected by vibrations. Temperature affects the performance of the LVDT. The output of the LVDT is AC signal, therefore, a demodulator network must be used if a DC output is required. The dynamic response is limited mechanically by the mass of the core and electrically by the frequency of applied voltage. The frequency of the carrier should be at least ten times the highest frequency component to be measured. The LVDT can be used to measure the displacement of ranging from a fraction of mm to few cms. By using it as a secondary transducer, it can be used to measure weight, force and pressure etc. The fluid pressure measurement can be done by using a Burdon tube as primary transducer whereas force can be measured by using Load cell as a primary transducer. Thanks for reading about lvdt theory, lvdt advantages and disadvantages. © https://yourelectricalguide.com/ lvdt theory, lvdt advantages and disadvantages.